‘Tis the season of Bel-Aethne. May all of you enjoy the rites of spring. Here in KC, the transition from April to May was marked by a cold front and some severe storms, but the sun is out now and the fine spring weather has returned. The grass is growing (a little too fast), the trees are budding, and the tulips are in full bloom. The semester is wrapping up at Avila. We have just finished the last week of classes; now we are getting into finals. I am also in the process of packing up my office, as much of O’Reilly Hall will be gutted and remodeled this summer. Preparations are in full swing for this summer’s NAPIRE program. About a week ago, Coordinator Barbara Dugelby and I hosted a workshop for home mentors and incoming research mentors. Right now, we are hammering out the final details of the schedule. We have a great group of students and faculty coming into the program this summer; I am really looking forward to it. You can read the full reviews on Goodreads or Amazon. It’s great to get so much positive feedback on this novel, which is such a different story and presented very unique challenges compared to its predecessor. Thank you to everyone who has taken the time to write a review on Goodreads, Amazon, or elsewhere. This is a great way not only to express support for the author, but to help other readers decide whether High Maga is the right story for them. Last Monday, I had a guest post on Heroines of Fantasy where I talked about war and violence in High Maga, and what inspired me to write such a dark sequel to the decidedly brighter Eolyn. I hope you will stop by to read it, if you haven’t already. The post was written from the heart, and brings to light some of the formative experiences of my own youth. Eve Brackenbury is opening a new store in historic downtown Blue Springs, called the Inklings Books and Coffee Shop. She’s invited me to do a signing there the evening of May 22nd. 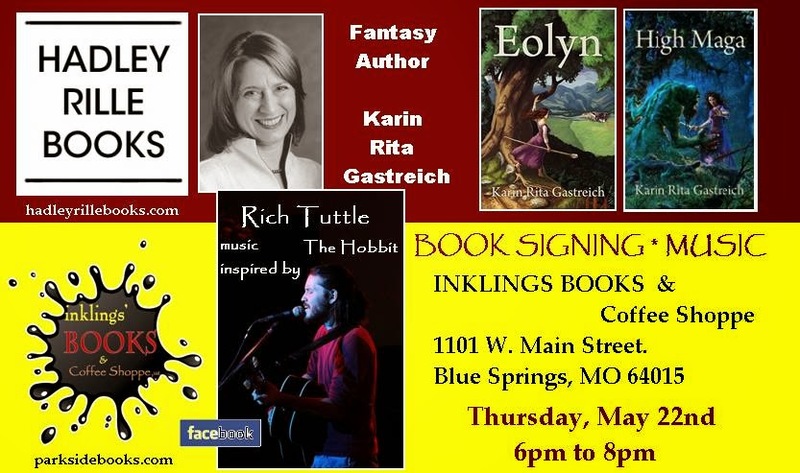 Author Mary C. Chambers will also be with us, and Rich Tuttle will be playing music inspired by Tolkien. The fun starts at 6pm; see the flyer below for more information. ConQuesT 45 is on its way, and I am very excited! We’ll be at the Marriott in downtown Kansas City on Memorial Day Weekend. If you’d like to attend my panels and readings, see my schedule for ConQuesT 45. That’s the news for now. I hope you are in for a great week.